I am also linking to Between Naps on the Porch's Tablescape Thursday a this link:http://betweennapsontheporch.blogspot.com/2010/03/welcome-to-80th-tablescape-thursday.html. 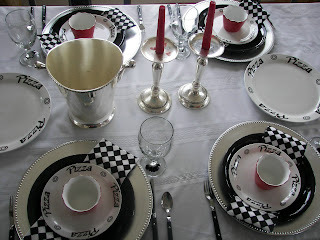 You can visit other blogs and see beautful tablescapes. At our home, many Friday nights are pizza nights. We make our own pizza dough (half white and half whole wheat) and everyone rolls out their own crust and tops their own individualized pizza. No gourmet pizzas here, unless you count artichoke hearts! My children like the normal pizza ingredients like pepperoni, ham, and cheese. My husband and I like to put vegetables on our pizzas... onions, peppers, roasted garlic, pepperoncini, artichoke hearts, etc. There is no Fontina, pear, walnut pizza on our table...not that my husband and I wouldn't like that kind of pizza! My sister Jackie has a wood-fired pizza oven; she has had pizza parties with up to 100 guests. No wood-fired brick oven for us...we just crank our oven up to 500 degrees! THIS IS A DISCLAIMER: WE HAVE NEVER EATEN PIZZA THIS FORMALLY...I am just following the directions from my daughter...to set a formal table! After putting this together though, we might have a formal pizza night! The red ramekins are just waiting for a nice, little fruit salad. I love my homemade stemware charms. I think the pizza plates are so cute! Pizza Plates--bought at a local grocery store--one large and four small plates all for $1.00!! I SPLURGED and bought three sets! Silverware: Wal-Mart--I bought this on clearance. The knives and forks were 25 cents for four; the spoons were 50 cents for four. Goblet Charms---Replaced the original charms with some Wal-Mart jewelry materials. They are not exactly wine charms (eg., different charm for each glass). This turned out great! I love those pizza plates. Pretty tablescape! I love the colors together. It is really neat how you and Tati play off each other's creativity. I absolutely love your black and white dishes! 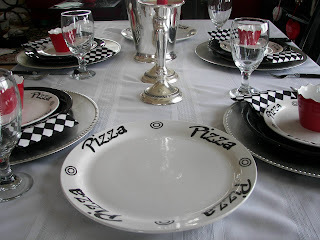 What an adorable Pizza night tablescape! Perfect! Love the black and white with the punch of red. So clever. Thanks for sharing. Thank you for stopping by my blog, too. What a wonderful idea! Your table looks great! 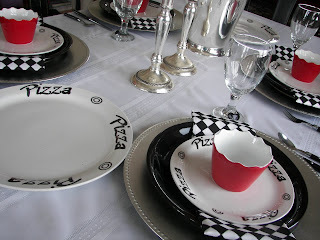 I think this table turned out wonderful and absolutely perfect for a "formal" pizza night! 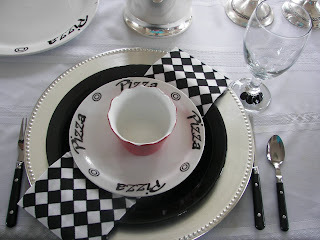 Joni, I am so drawn to the bold graphics of your tablescape! It looks just like a high-end designer store's merchandise. I like how you turned the checked napkin at an angle...makes it more interesting. 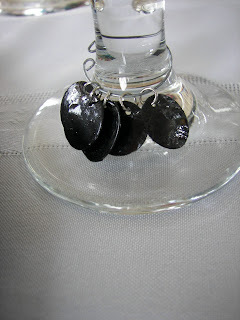 The hand done wine glass charms are darling. Joni, I'm so glad you stopped by to visit because now I've found you. I added myself as a follower. I don't have much time at the moment to visit all your previous posts, but I'll be back. 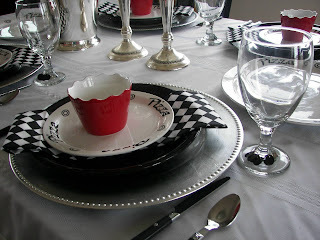 Love this black and white tablescape. If you visit me often enough, you will know that I LOVE black and white together. So your tablescape is wonderful!!! Great way to enjoy a slice of pizza! Hi Joni. So fun - I saw another pizza setting and it was really cool. Love the colors. That looks great..I came over for this weeks TTH, but I see I have missed a lot..So glad you stopped by!